Measuring pollutants in the air is very useful for getting a snapshot of the air quality at a particular moment in time. It can also be useful to observe a buildings performance over a longer period of time. This is where data logging comes in. 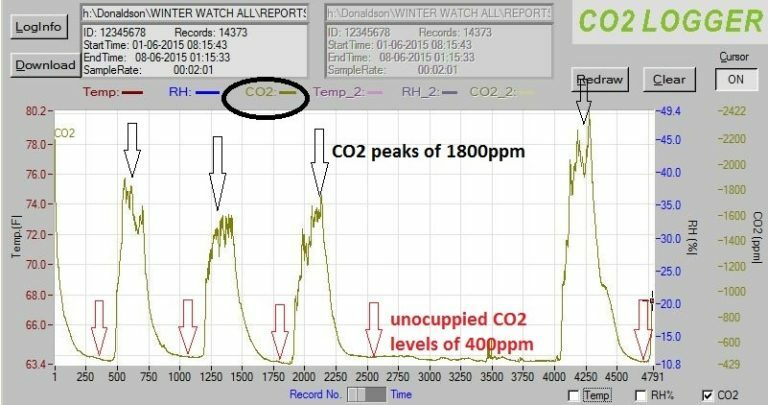 For example, Carbon Dioxide is a useful indicator measurement to assess proper ventilation. If it is measured and data logged for an entire day, the resulting graph will show if there are periods of time when ventilation is inadequate.The chart below shows building performance when occupied well above ASHRAE recommended levels of 1100ppm. This method of data logging can be applied to virtually any measurable parameter such as moisture, VOCs, particulates, ect. Donaldson Environmental is able to test and data log your building to help assess performance and optimize building health.